Rugosa roses Rosa Eurosaare a specific botanic class of roses native to northern Asia, eastern Siberia, western Alaska, and the northeastern American continent. 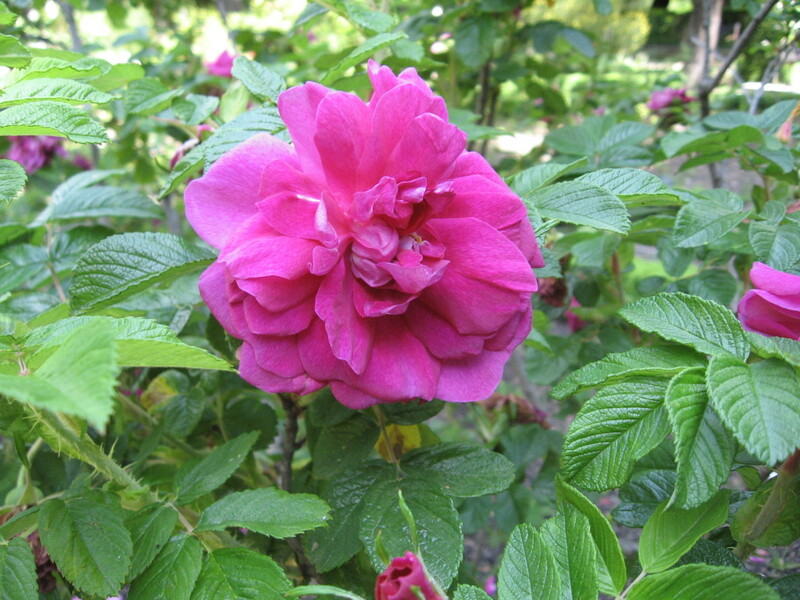 The “parent” plant (R. rugosa) was discovered (by western rosarians) in Japan and western Asia in 1796. Rugosas received their name from a Latin word which means “wrinkled” due to their dark green, leathery, crinkled leaves (from which due to ). They are extremely cold hardy and typically rated to Hardiness Zones 4 or 5 (-10 to -25F/-20 to -30C). For rosarians in southern climates, this may mean some difficulty in finding specimens which can adapt to hot, dry summers; although I have three specimens in my north-central Texas garden (Zone 7b). R. rugosa roses are usually “singles” that is, they have one row of five petals. Hybrid Rugosas are “doubles” having numerous, informally-formed petals. Colors range from white to pink to red to purple. All are noted for their strong perfumy scent. Rugosas are remontant (repeat-blooming) if one removes spent blossoms. If left to remain on the shrub, however, brilliant red-orange rosehips are produced to feed man and beast during the winter. Rugosas are also noted for their suckering (their production of stems from the roots). In some parts of the U.S. they have become a pest and are routinely weeded out. Hybrid Rugosas are less likely to sucker than the species types. Likewise, purchasing specimens grafted to root stocks will also reduce this suckering characteristic. When planting Rugosas grown on their own roots, it is wise to place them carefully in the garden, allowing plenty of room for them spread. Rugosas are also notoriously disease resistant. And because of their floral form, do very well when used in a less toxic IPM program. Most specimens do not like to be sprayed with anything (except plain water). I do not recommend applying any pesticides or fungicides, even if a rarely seen bout of black spot is noticed. Otherwise, phytotoxicity is quick to follow and the shrub will rapidly defoliate. This also means one may have to “let Nature take its course” if pest beetles like Japanese or May/June Beetles are a problem. To control pest beetles, applications of beneficial nematodes (Steinernema or Heterorhabditis sp.) to the soil around the rose may be a better method of control. For a first time Rugosa grower, I would recommend Hansa (picture above), a 1905 introduction which produces brilliant red-purple, extremely fragrant blooms. It is comparatively small growing (4 – 5ft./1.2-1.5 m). In fall, it produces red-orange hips suitable for making rosehip jams or jellies that is, if you can get to them before the birds do.